Carmen & Alistair were inspired by our creative curved kitchen designs featured in our projects page and commissioned us to supply and install a unique design tailored to suit their requirements. The kitchen space was being extended to create a focal point in the house combining cooking, entertaining, casual seating and a formal dining space. This stunning space with vaulted ceiling needed a kitchen with a real wow factor, we were happy to oblige and the end result looks simply stunning. Gloss kitchen units in a warm Alabaster finish were combined with rich Wenge veneer tall units and breakfast bar panel to create a stunning timeless design. The curved peninsular section features seating for 4 people and is seamlessly linked to the backdrop with a curved feature drawer set topped with the gas hob. 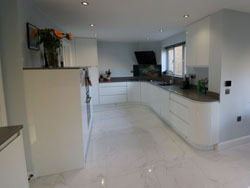 Silestone Vortium quartz worktops and Porcelanosa floor tiles complete the look for this modern kitchen design. Mike and Vicky wished to change their kitchen into a larger family space with a creative feature island unit and breakfast bar. This was achieved by integrating the kitchen and utility room together and creating a new utility room in part of the integral garage. 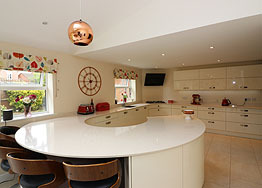 Having seen typical standard designs at other suppliers Mike and Vicky were inspired by our unusual island proposal which featured sweeping curves and a breakfast bar without compromising the feeling of space in the kitchen. Our Langton kitchen display provided the colour inspiration for this design but teamed up here with the Finsbury door range. The Seal Grey island and base units combine perfectly with the Soft Grey tall and wall units and White quartz worktops to create a modern airy space perfect for entertaining and family life. James & Katie wished to modernise their new family home in the Northamptonshire village of Pitsford. The existing kitchen didn't suit their needs, with a growing family they needed more storage, improved ergonomics and a modern open family living space. The build project included the fitting of a large bi-folding patio door and removing the wall separating the kitchen and dining space. ASL Kitchens were tasked with designing the new kitchen and optimising the storage whilst keeping very clean and minimal lines. Katie wanted a large island in a contrasting colour. We chose gloss graphite for this and designed the island to utilise a full length of quartz, removing the need for a joint. The island features a breakfast bar for 2 people, integrated dishwasher, recycling bin unit and a drawer wrap unit beneath the Blanco under-mount sink. The island is finished on the ends with with handle profiled posts which creates the illusion of a floating quartz worktop all around. 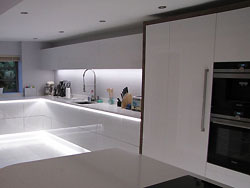 Mr & Mrs Kumaran were looking for an inspirational modern sleek handless kitchen for their home in Wootton. This is a busy kitchen and function was particularly important, especially the hob area, which often had 4 large pans being used at the same time. The client loved our curved showroom display with its large curved stainless steel Barazza 4 zone gas hob which suited their requirements perfectly. 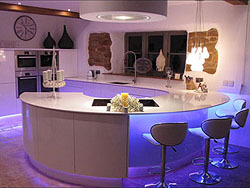 We used this as the basis of the design with a curved corner unit to maximise worktop space. Mr & Mrs Betts were renovating a stunning Art Deco property in Moulton to include a new kitchen, large utility room, bathroom, en-suite and extensive floor tiling to the ground floor open plan area. The ceilings in the kitchen were just 2.2m high and the existing space was very dark and subdued so creative use of lighting and reflective materials were very important. This stunning modern design features a striking combination of Parapan Servo Drive handle-less kitchen units and bespoke horizontal grained walnut veneer framing, LED plinth, worktop and under unit lighting, Siemens appliances and Caesarstone quartz work surfaces. 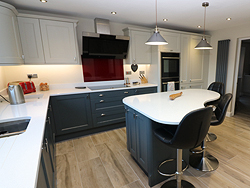 Mr & Mrs Hill were looking for a premium quality kitchen for their beautiful home in Church Brampton and having been recommended by a previous customer visited our Northampton showroom. 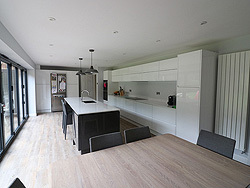 The property was being extended to included a much larger kitchen space integrated with the existing dining area. This allowed for a well proportioned layout with a large central island as the main focal point. Owners of a beautiful stone barn conversion for more than 10 years Mr & Mrs Stanley wanted an inspirational kitchen design that would create a stunning modern centrepiece in their open plan home. 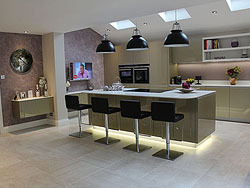 The curved display kitchen in our Northampton showroom provided the inspiration for an organic curved peninsular layout. The client also wanted a very minimal design that flowed seamlessly without any handle profiles.